In the end, the anticipated Democratic “blue wave” was more of a blue trickle. Against the backdrop of Donald Trump’s historically unpopular presidency, Democrats regained control of the House of Representatives, as predicted by most polls, but lost two Senate seats, despite getting some 8 million more votes than the Republicans. Democrats won key gubernatorial races in places like Wisconsin, Kansas and Nevada, but high-profile black candidates Andrew Gillum and Stacey Abrams fell agonisingly short in Florida and Georgia respectively. So too did rising star Beto O’Rourke, who very nearly robbed former presidential hopeful Ted Cruz of his Texas Senate seat. With a confusing and fractious set of results to match a fractured nation, no clear post-election narrative has emerged. As FiveThirtyEight’s election wonk Nate Silver tweeted, “This is the hardest election ever about which to write hot takes”. And so, news outlets have created their own narratives about the midterms, ranging from muted optimism among progressive-leaning outlets, to a more Trump-friendly line taken by the Murdoch press. Traditionally progressive outlets treated Tuesday’s results with cautious optimism, noting the real damage a Democratic House could do to Trump’s agenda. “Things could get ugly for Donald Trump”, wrote ABC North America correspondent Stephanie March, while noting “the results will allow both parties to spin the results in their favour”. Appearing on ABC’s The Drum, University of Sydney academic and former Democratic staffer Christopher Neff argued the election was “a historic check on the Trump Administration”. “They have lost the House of Representatives. I think that check redefines his presidency, and hopefully reestablishes American values around the world”. Foreign publications also put a positive spin on the Democrats’ performance. The New York Times, for example, noted that in the face of structural disadvantages, the Democratic gain was more impressive than results indicate, while The Guardian praised the results as “a welcome start”. Fairfax had a more muted take. Matthew Knott, who has been covering the midterms on the ground, wrote that the results should serve as “a blaring wake-up call to both Donald Trump and the Democratic Party”. Meanwhile, former Fairfax US correspondent Nick O’Malley noted the centrality of racism to the GOP’s showing, arguing that the President’s aggressive race-baiting — a caravan of Central American migrants became a central motif in the Republican campaign — helped rev up the base and expand the party’s Senate majority. 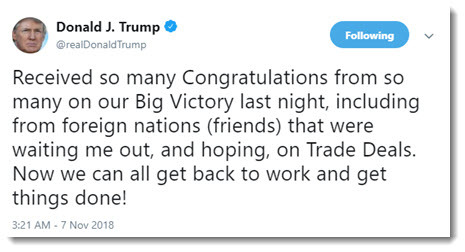 Unsurprisingly, Donald Trump took to Twitter to voice his excitement about the “Big Victory”. This cynicism of Trump’s attempt to gloss over his House losses, coming in spite of a recovering economy, wasn’t lost on journalists. A New York Times article syndicated in the Herald compared the President’s diagnosis with that of his predecessors, Barack Obama and George Bush, who saw the results as a “shellacking” and a “thumpin’” respectively. Still, many among the News Corp commentariat in Australia offered a variation on the Big Victory line. 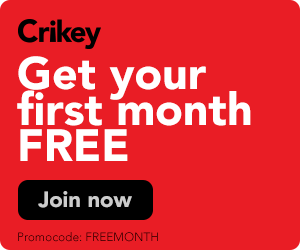 Over on Sky News, Daily Telegraph opinion editor James Morrow reminded viewers that both Bill Clinton and Barack Obama both oversaw significant midterms losses two years into their first terms. “For a president with popularity ratings that aren’t great, who’s very divisive, who has a media that is largely opposed to him, he did pretty well,” Morrow said. Writing in the Telegraph, Morrow argued that the Republicans “won big in ways they weren’t supposed to”, as voters rejected the Democrats’ capture “by an angry, progressive, Socialist left”. 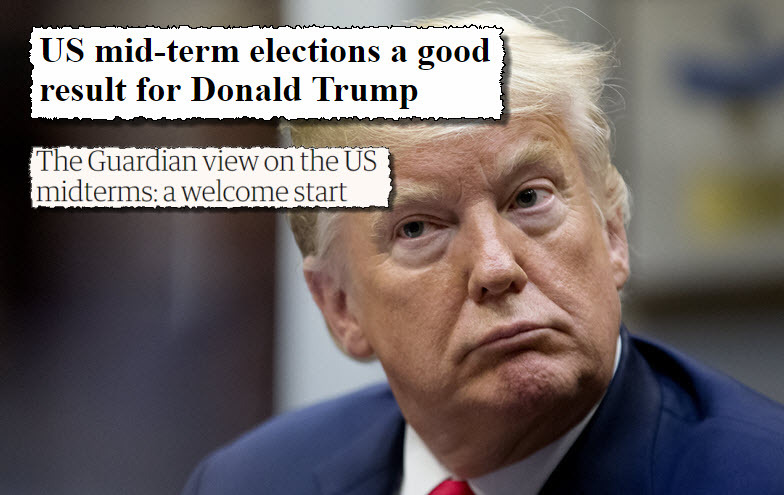 The Australian’s Greg Sheridan concluded that the results spelled “a very good result for Trump overall, and a return to normal in American politics”. “Trump’s style and tone remain unique, sometimes brilliant and sometimes repellent,” he went on. Perhaps most bizarrely, The Australian’s business columnist Robert Gottliebsen concluded that the markets apparently agreed with Trump’s interpretation of the results. “Rarely have we seen such a ringing endorsement by markets of a sitting president,” Gottliebsen said. According to Vox reporter Zack Beauchamp, the midterms are evidence of America’s “cold civil war“, one fought between two camps with fundamentally different senses of identity and visions for the country. Republicans and Democrats, writes Beauchamp, inhabit different political realities and believe in different narratives, driven by their consumption of different media. In their coverage of the midterms, Australian outlets have, to an extent, imported this division. But the problem with an election like this one is that no single narrative neatly fits the results on the ground. Trump is so very confident in his massive victory, the massivist victory in the history of the World…that he’s just fired Jeff Sessions and begun banning member of the press from the WH. His latest photos show a change in hue from orange to a red. their way or the highway that less than half of the population can be bothered to get off their fat arses and vote. The dems and independents will win probably 26 of the 35 seats on offer – i.e. 75%. The lose because they were the incumbents in most. Corrected arithmetic: Dems/independents projected to win 24 0f 35 senate seats on offer (65%) with 46million of 80 million votes counted so far (57%). Certainly the deck is stacked against the cities by malapportionment (especially in the senate) and the democrats by gerrymanders and voter suppression, but these figures do not provide evidence of these features of US politics. The tragedy for American workers is they never had a real Labour Party. Hence: low wages, hardly any paid holidays, no sickies, very expensive healthcare, hopeless savings/ super arrangements, food stamps for full time workers, etc, etc. In a way, this piss weak semi success is bad news for the amerikan polity because it will delay the urgent reform necessary to deal with the 21stC. Imagine how bad it could have been had la Klingon been allowed out to campaign- the sheer disgust & horror at all that she represents would have reduced the already derisory turnout from people too nauseous at the thought of appearing, in any way to endorse her continued example of the corrupt & irrelevant Wall St wanker brigade. that its the Mrs in this case.